Day one within any startup represents a blank canvas. You decide your company name, brand, website URL, and the type of product you’re building. Another bonus of building your own business? You get to pick the people with whom you’re going to work with to get all of this done. All of this will ultimately shape your company culture, whether you purposefully and actively build your culture or not. ; it is what keeps the team happy, helps attract top, new talent to the team, and it will have a significant influence on interactions with stakeholders. Having a bad company culture albeit an excellent company in all other respects (superb product, successful marketing, etc.) is literally like having one bad apple in a box; it will eventually spoil the rest. If you need a reminder of what bad culture looks like, consider all of the recent negative press that Uber has received. Regardless of how you would like to define or label their culture, it was a culture focused on growth at all costs. The recent revelations though have seen Travis Kalanick leave his position and the company reportedly losing an estimated $10BN in market cap. While these revelations just came to light recently, some quick research shows that there has been some recurring trend related to questionable behaviour from Uber for years. The negative press has just been a lagging indicator of a bad company culture. But what does Uber’s culture mean to you? When you are just starting up, company or team culture is yet another thing that is on your to do list for survival. While most founders are paying more attention to culture sooner, this is often limited to recruitment where the focus has shifted slightly from hiring “people with skills” to “people over skills”. This is often not enough to create a sustainable, wholesome culture. In this article, I will share how my team and I defined our culture on Day one, but then evolved it as our team and the reach of our business grew. The approach we took can be best described with a borrowed and slightly-adapted term: Minimum Viable Culture. At the outset, there are many things for which you will not have answers. And your company culture will be one of them. You should, however, draw a line in the sand and give yourself some point of reference from which to work. It doesn’t have to be perfect; it just needs to be something to which you can point. Interestingly when I founded Conversio, my point of reference was a simple list that I had scribbled down in my notebook after I had exited WooThemes a year prior. The list was simply titled “Things I will not do in my next company” and was my retrospective of things that I would like to change in future startups and teams. At WooThemes, the culture was more something that happened to us; my co-founders & I were younger and inexperienced in leading a team. They were aspirational; things that were proven or stress-tested, but that would shape the future. The benefit of this is that it shapes the collective awareness around certain ideas; the most important one being that every individual will be joining a team that will pursue our commercial goals that align with a set of values. This is about setting the stage, and you can see that also in the way that I had communicated in the above email. At this stage in your journey, it is not about having clear values or a visible culture; it is just about agreeing that you will purposefully build your company’s culture. Use your personal values and hard limits to draft the first version of your company culture code. Now you can use this as you start building your initial team. You are now at a stage where the wheels of your startup are beginning to turn nicely; you might have a public product, your first users/customers and some things you are learning about has accelerated considerably. This also means that your operational to do list has grown significantly which could put softer considerations (like culture) on the back burner. In an effort of keeping culture at the top of our mind, we scheduled our first team retreat about six months after the team first came together and four months after we had launched the first version of our product. The five of us had been building our internal relationships and workflow, were acquiring new users at a nice pace and had just decided to raise our seed round of funding. I can remember our first retreat was quite an unexpected experience for me. At WooThemes our annual retreats, for example, had a prominent boozy culture, whereas Conversio’s first retreat had a distinct lack of alcohol. Alcohol aside, I realized that my expectations of what our business culture could (or should) be would need to be fine-tuned with the help of this team. 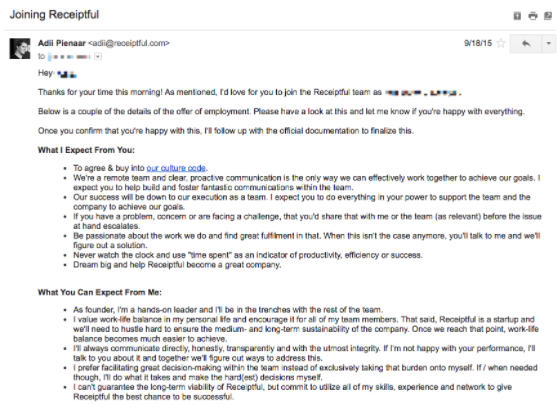 Even though I had tried to recruit individuals with a focus on who they were instead of merely what skills they could contribute to our startup, the truth was that no recruitment or interview process would make us all know each other fully immediately. For us to define and to create a culture based on our collective values, we would need to get to know each other better. That first retreat was the first time that we re-visited the original culture code I had created. We discussed what culture could mean to us relative to that initial code, but also alongside the things we had learnt working together the previous six months. Since we were also starting to raise our Seed Round, we could also consider the kind of company that we wanted to build in the long-term. This discussion helped us identify the bugs that we would need to consider and fix going forward. It also revealed some of our strengths that we could use as opportunities for future growth. One of these strengths we embedded in our decision was to be a fully distributed and remote working team. We had managed to find the majority of our initial team through We Work Remotely and this became one of the first clear things to which we could point to help us grow the team. The reason something seemingly simple like a particular job board helped us, was because it highlighted a possible strength and made it an explicit value to pursue. It helped serve as a filter and attracted a certain kind of individual (that was experienced in and keen to work in a certain way.) To this day, we have found about three-quarter of our team through We Work Remotely and this “strength” also evolved into one of our core values: Independence. Review your initial culture code or team values a couple of months after founding. Determine the bug that needs to be fixed or just eradicated. Identify the things that have been working, and that has united the initial team. Start doubling down on that. Do such a review periodically to always float your company culture and values up to the team’s collective awareness. In product design, we often speak about product-market fit; the moment when you have built your product in such a way that the market considers it a solution to their wants or needs. Once you reach this point, your operation mostly shifts beyond learning how to get to this point and more towards doing more of the things that have helped you get here. Building your culture in an MVP-esque way will also lead you to the point of team-culture fit. I would define that as the moment where the team can define – and put into words – a significant part of your culture. For us, this happened on our second team retreat, about 15 months after we first started working together, when we were ten team members. Here we prioritised a big discussion specifically about our culture with the exclusive aim of coming up with a concise definition of our culture. It is that our “Life- and Family-First” Culture properly shot roots with five core values: Passion, Curiosity, Independence, Honesty and Rebellion. These were the values that we agreed most clearly defined both the way that we had been working until then and also how we wanted to work and act in future. This felt like a good representation of who we were and wanted to be. These values – while refined – were also consistent with the original culture code that I had written, which was proof that a bigger framework of related values had been influencing our behaviour and culture until now. In the months following this, we often had discussions – only sometimes proactive – where our values would pop up into the conversation. One such discussion, for example, led to us creating a better maternity – and paternity – policy. Or I can remember a conversation about a possible second round of funding where we decided that it would limit and challenge our future independence; so we didn’t pursue it. What I found is that once we were able to define our values concisely, it was easier for us to identify specific things that we could implement to build out our culture. One example was our paternity policy. Another was how we changed our unlimited holiday policy to a required minimum holiday policy (to remove any guilt around taking time off and encouraging our team mates to take more time off). This part of the process is all about identifying the things that were working and doing more of that. Have that big discussion. Define a list of core values that your team has lived and that they want to use to guide your future. Identify concrete things (which aligns with your values) that you can start implementing in support of these values. 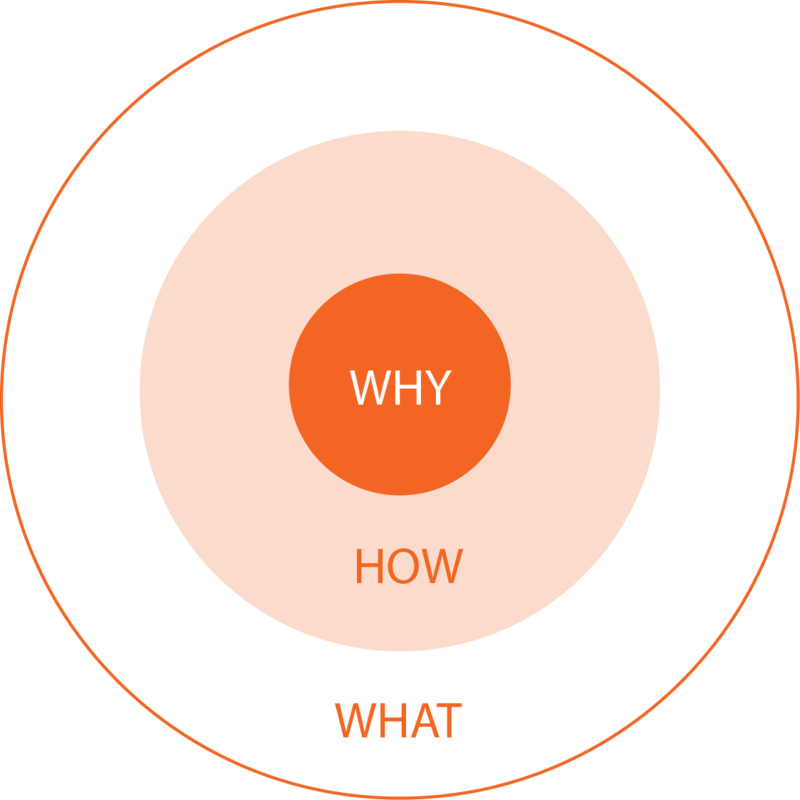 Using other words, your “why” is best manifested in your value and culture. As your company and team grows, you want to keep growing the prominence and significance of that inner circle. You want your culture to permeate everything you do; be the North Star for all your decisions and actions. Culture is something that will continue to evolve as you grow the team because every additional individual will be adding their unique personality to the mix. As the company grows, macro considerations will also set new challenges or requirements of you and your team. In this sense, your culture is liquid, and like moving water, it does find a way through all cracks. We go on a team retreat every 8 or 9 months and are currently looking to shorten that to 6 months. We have two goals for these retreats: deepen the relationships we have with each other and discuss the most important, bigger picture things that continue to shape our future. By now, you should not be surprised to hear that our values, culture and ”way we work” often finds its way onto the centre stage of these discussions. The face time and in-person collaboration has improved our efficiency and performance over time too. Rigorous Debate.This is something which I have only lately defined as such and after reading Radical Candor by Kim Scott . We have always had a very transparent team and flat, almost-democratic (I do remain the founder with the ultimate veto vote) decision-making process. We now encourage rigorous debate of all our big decisions, especially about how it relates to our values and culture. One of these debates often relates to our pricing, where we know all SaaS experts would advocate for an increase in our prices, yet this just isn’t something that feels right or aligns with our culture (we are a bit rebellious after all.) Regardless of which topics you debate this through, it is just crucial for the team to have the opportunity to bring their whole selves to these and in a robust way collaborate to come to the best answers. I mentioned earlier how every new person that joins your team influences the evolution of your culture. Sometimes this is best seen in the seemingly inconsequential things. For example, our Irish team mates have converted us to saying “noice” (with an emphasis sounding like “oy”) instead of “nice.” Or because of a typo, the best way to now mischievously flaming someone on slack is to type :flam (we even have stickers of this.) We also have a Papa & Mama Bear on the team; designations they were initially given because they were the oldest, but they have since stepped into almost-paternal roles for the rest of the team in a servant-leadership way. As isolated occurrences, these things don’t create a culture. But in a “sum being bigger than the individual parts,” we have given individuals the space to shine and to also put their stamp on our collective culture. There may be no “i” in “team,” but we’re still a team of unique individuals, and our culture should not just reflect that, but empower that individuality and uniqueness. The title of this article promised to give you a map to building your culture in the pursuit of global success. I believe I had made the argument of why culture matters and at the very least – using Uber’s example – highlighted the risk of having a bad culture. The truth is that culture – on its own – is not the thing that will bring you success in whatever way you may define it for yourself and your team. Building a successful business requires many different things to work well. Culture is, however, the pulse that influences every one of those things. Let me explain with a personal story. I recently took ten days off to travel to Iceland with my wife. During this time, I switched off all of my email and Slack notifications; and I left the team to guide our ship. The only reason that I could do this without an anxiety needing to check in or influence a decision was that we had a defined culture. Our team might use buzzwords like “cost-benefit” or “Adii%” (our definition of MVP) to describe my perspective on most decisions, but the fact that these are known reconnects all decisions and actions to our values and culture. And crucially this happens with any one of us being exclusively responsible for this. Our culture is our hive-mind. Once defined and clear, your culture becomes the ever-present framework within everything in your company happens. People, products and market conditions may change, but your culture is the one constant that will continue to drive you forward to success. Adii Pienaar is the Founder of Conversio, and all-in-one ECommerce marketing dashboard solution.